German born, in Brühl, Rineland in 1891, died Paris 1976. German French painter, sculptor, collagist and inventor of Surrealist techniques. He pioneered a method called frottage, in which a sheet of paper is placed on the surface of an objectand then penciled over until the texture of the surface is transferred. One of the most influential of the Surrealist painters. After enroling at Bonn University in 1909, Ernst .He began to study philosophy at the University of Bonn in 1909, but neglected his studies of philosophy to became increasingly preoccupied with painting and was self-taught, but influenced by van Gogh and Macke. Fascinated by the art of the insane. He met Macke in 1911 and through him the Blauer Reiter group. Ernst began exhibiting in in 1913 at the First German Autumn Salon in Berlin organized by Macke and Kandinsky. Made his first visit to Paris in the same year. Spent the war as an artillery engineer. The paintings of de Chirico helped to stimulate his interest in dream-like fantastic imagery, and he founded the Cologne Dada group with Baargeld and Arp (1919-21). After the war Ernst became a leading figure in the Cologne branch of Dada. In 1919 he composed his first collages which he used to produce 'a faithful and fixed image of my hallucination'.. In 1922 he moved to Paris, where his friendship with Breton and Eluard led to active participation in the Surrealist movement and he painted 'Les Hommes n'en sauront rien', which was one of the first masterpieces of Surrealist painting. His discovery of the technique of frottage (rubbing) in 1925 provided him with a means of evoking hallucinatory visions. In 1925 he developed another crucial technique- 'frottage': 'At random I drop pieces of paper on the floor and then rub them with black lead'. Ernst combined these images and textures into drawings and paintings. The effect was that this technique freed him from the traditional figurative process he had used up to this point. The first frottage drawings were published in 1925 as a book, 'Histoire Naturelle', and in 1929 he made his first collage book, 'La femme Cent Tetes' 1929, and Une Semaine de Bonté 1934. 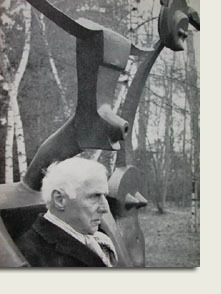 He made his first sculpture in 1934. After an argument between Ernst and Breton, he left the Surrealist group. He went to the USA as a refugee in 1941 and married Peggy Guggenheim, living first in or near New York, then in Sedona, Arizona.